Capture special moments as they happen. 80% of ECE educators surveyed said Educa saves them time creating learning stories and observations. Create learning stories and observations on-the-go from any device, save drafts and come back to them later. 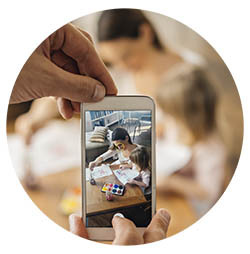 Share videos, photos and audio privately with family. Link EYLF outcomes to learning stories and observations. Gain valuable feedback from family members. Communicate instantly with other educators and directors. Collaborate with parents and caregivers. Still using paper books? Print beautiful stories using our print wizard. Turn on the peer review module to allow a coworker to check your work before sharing it with parents. Turn on your own personalised curriculum. Meet elements within Quality Area 1: Educational Program & Practice. Complement and enhance pedagogical practices. Track your progress with powerful reporting tools. “Educa is so easy to use. I love that parents can instantly see stories and photos. It’s great to have reminders when children have not had a story uploaded for a while.